This program is a derivation of the Multivariate Standard Normal Probability Distribution example. Users will be able to populate multivariate standard normal deviates on the spreadsheet for analysis. For detail on this distribution, please refer to the Multivariate Standard Normal Probability Distribution example. In this example, we have 3 variables that are distributed normally with mean of 0 and standard deviation of 1 with their correlations as shown in the chart below. We want to find the probability that variable1 <= 0, variable 2 <= 1.5, and variable 3 <= 2.5. We run 10,000 iterations and come out with 48.91% (the probability). We check the simulated data using the first and the second moments, the mean and the standard deviation. 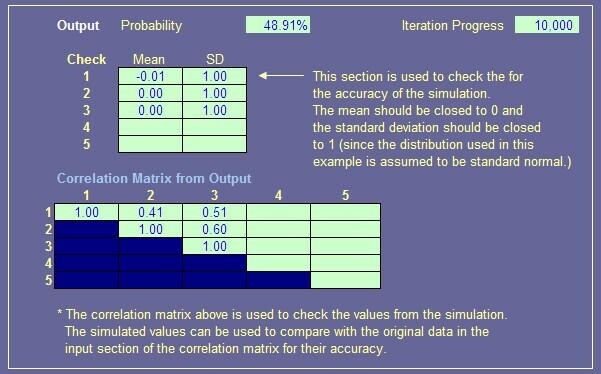 A correlation matrix is also used for checking purpose. The following displays a sample of the populated data for the simulation.